I'm working on a musical using Watchout for the first time. The musical director and musicians are using a click track, and I'd like to use that click track (or more specifically, MIDI messages related to that click track) to sync watchout cues to the music. I have Qlab2 or maybe Qlab3 running on a mac mini, and Watchout running on two windows machines. The click track will also have two or three audio files synced to it for playback through the sound system, so I can't have the click track and these other audio layers in Watchout without purchasing an audio interface for the windows machine. I figured the best approach is to have click track trigger midi show control messages in Qlab to be sent to Watchout for this (and potentially all of the watchout cues). If so I need two midi interfaces - one for the windows machine in order to accept midi messages, and one for the mac mini, in order to send midi messages. Does anyone have experience with these and/or any other suggestions for my setup? your plan to have Watchout only to receive and put Qlab to send it out sounds good to work. any type of USB-MIDI box would work good. 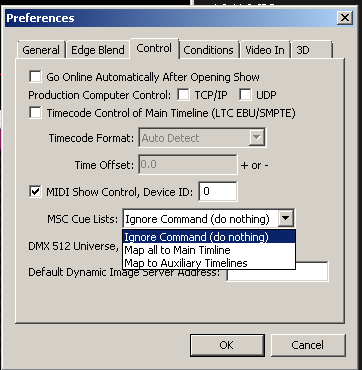 You may use MSC (MIDI Show Control) to trigger cues and timelines in WATCHOUT. Another option may be to use timecode from your sound system to sync WATCHOUT to an external source (assuming your sound system can output timecode). Thanks for the replys! Is there a resource I could referenece on how to set up MSC in watchout? I'm having trouble figuring out exactly how to do it from the user guide and tutorial videos. I'd like to send MSC from Qlab to trigger all watchout cues in the main timeline and an auxiliary timeline. Then set Qlab to be that controller #. Also ensure that you set Watchout to map cues to Main or AUX timelines. I can't seem to make anything happen unless i do that. Once setup, it seems to work extremely well. as the console will always send a cue list parameter. you must choose between main timeline only or auxiliary timelines only. Control systems can do both of course. acted upon) if a list number is specified. all such commands to the main timeline. name must be numeric, to match the list number).